The Ilocano version of the Portuguese original, the Iloco Empanada is a meat pie with a very distinct Ilocano flavor with a hint of Spanish influences. 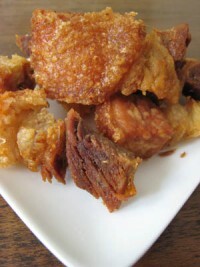 Referred to by most Ilocanos as "chicharon", the bagnet is nothing but pure pork belly heaven. 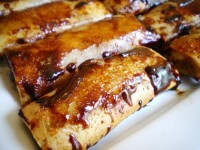 Turon is a Filipino snack that is made up of bananas wrapped in spring rolls and dusted with brown sugar then deep-fried. Extra fillings are added such as jackfruit, mangoes, cheese, and many more. It can be served ala mode with freezing ice cream on the side to contrast with the warm filling. 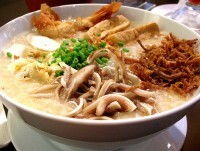 Lugaw is a rice porridge that is similar to the Congee of the Chinese but has a thicker texture. It is usually served with various cuts of meat such as pork, chicken, beef, or egg. It then topped with scallions, fried garlic strips, and/or crushed pork cracklings. Lugaw is best served piping hot and is perfect to consume during the cold season. 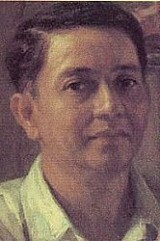 Kalamay (Calamay) is a sweet Filipino delicacy made from ground glutinous rice. Coconut milk and brown sugar are added and is also flavored with butter or margarine, peanut butter, or vanilla extract. There are different types of Kalamay based on the main ingredients used. 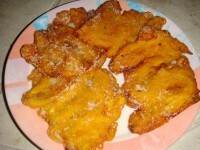 Maruya, also known as Banana Fritters, is a Filipino snack made out of Saba, which is a type of banana that can be found in the Philippines. The bananas are fried in a batter then sprinkled with sugar. Maruya is sold on the streets or can also be made at home. 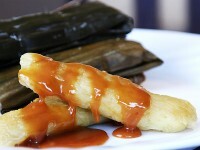 Suman is a native delicacy in the Philippines. It is made out of sticky glutinous rice and coconut milk which is then wrapped in banana leaves. There are many variations of this dish depending on the ingredients used. Sugar and fruits can be added to sweeten this dessert. 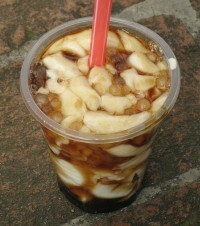 Taho is a popular snack that is made out of silken tofu and topped with brown sugar syrup and sago pearls. Taho vendors can be found in almost every street of the Philippines. Taho can be enjoyed warm or chilled - eaten with a spoon or sipped straight from the cup. Embutido is a Filipino-style meat loaf that is made out of ground pork and several minced vegetables. It is wrapped in an aluminum foil and steamed until cooked. Embutido can be served warm or as a cold cut and is perfect to special occasions as well as every day meals.